Parsnips are root vegetables similar to carrots and potatoes. In fact, confusion between parsnips and carrots goes back to times of antiquity and cultivation by the Romans. Parsnips have also been compared to potatoes, but parsnips have lower calories and half the amount of protein and vitamin C.
This vegetable is originally from Europe and Asia and was first shown to Americans sometime in the 17th century. Traditionally, the vegetable was used in Europe as sugar prior to the availability of cane and beet sugars. In fact, parsnips almost always have more sugar than carrots, radishes, and turnips. 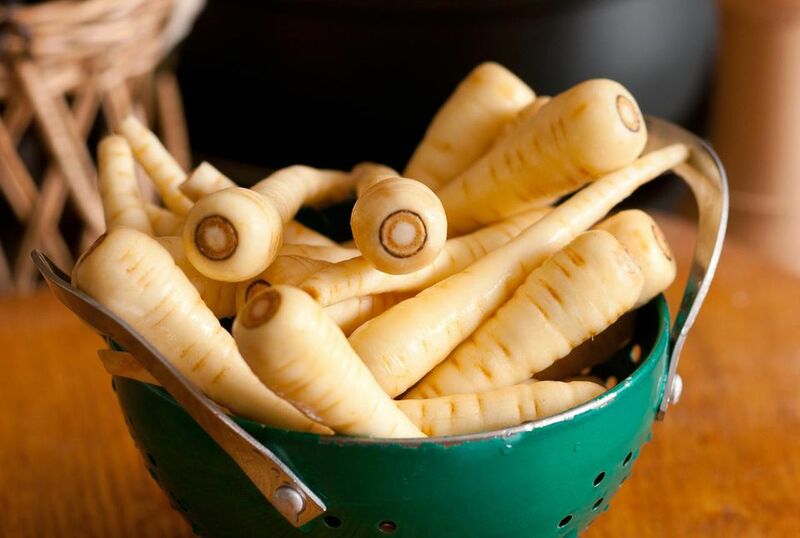 Today, parsnips are often added in stews and soups for a rich flavor, when they aren't being baked, boiled, roasted, or cooked in other numerous ways. Parsnips can be simply seasoned with a minimal amount of ingredients, such as honey and mustard, or they can be used for special occasions like Christmas dinner, which is a holiday tradition for many English-speaking countries around the world. About one cup of parsnips equals roughly 100 calories. The health benefits of parsnips are plentiful and include advantages like a reduction in cholesterol levels and blood pressure, a better digestion process, and prevention of diseases like depression. Nutritionally, parsnips are packed with potassium, magnesium, zinc, iron, and other vitamins and minerals. You can eat parsnips raw, but many recipes require it to be cooked. They are also often used to replace carrots and have a sweeter taste to them. This vegetable is versatile and can be prepared in many ways. With smaller and tender parsnips, you can peel and grate them raw to use in salads. On the other hand, if your parsnips are over-sized, you will need to trim out the bitter core before or after cooking. Peeled and pared parsnips will turn dark when exposed to the air, so it's important to cook them right away or hold them in water with a bit of lemon juice added. Parsnips are best when they are roasted in the oven, although many like them steamed and mashed like potatoes. To avoid mushy parsnips, add them to the pot near the end of the cooking time. For cooked parsnips, many prefer to boil or steam the washed root and then scrape off the skin to preserve nutritional value. Complementary herbs include basil, dill weed, parsley, thyme, and tarragon.